The days continue cold. There was even a threat of snow in our supposedly sunny state of Queensland. A rare occurrence. The kids love it. I saw snow for the first time in Scotland many years ago, aged nineteen. I was working in a Children’s Home. The young ones couldn’t believe their luck – an adult willing to play in the cold with them – snowballs flying. Maybe not such an adult! Editing: Progress slower than hoped. More effort than expected to weave in essential background from Book One. Hopefully picking up most issues, but will have to rely on friendly critiquers to find the outliers. Satisfied overall. Other writing: Have been toying for a while the notion of compiling a topic-based collection of pieces. Over the last few days I’ve settled on the notion of ‘locked’. The ideas are flowing for short stories, reflections, mini-essays. Who knows if or when it will come to fruition. At the moment there are around thirty topics in the frame. Short stories: Entered two stories for competitions within recent days. Although they are not remarkable in any way, it felt good to think outside my family saga series. I had fun fictionalising around some real life nursing incidents from long ago. Restless thinking: It seems premature to be thinking two more novels when I still have almost two more to edit, and none of the three existing ones published, but that is what is happening. One has a few chapters down and might stretch to novella length – a fairly light-hearted story. The other would be the fourth in the family saga series, with Freya settled back in Australia after two humanitarian aid missions in Africa behind her, and becoming an advocate in the fractious politics of international adoptions. Reading: Enjoying the Yeldham novel, Glory girl, based around a true story. It’s good to be reminded of early aviation days in Australia and the beginning of QANTAS and the Flying Doctor Service. I’m set up for weekend with a surfeit of books and expect to dip in to each of the ones pictured. 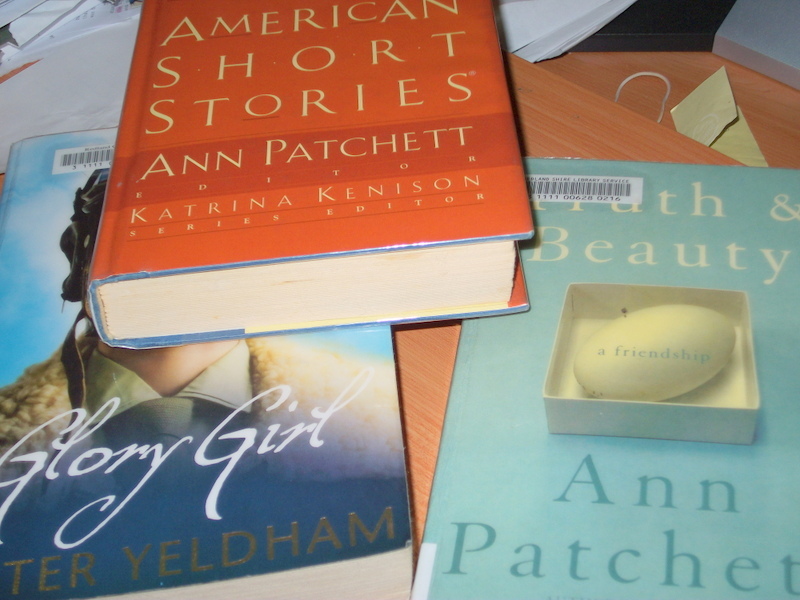 I’m also including some interesting and amusing links for anyone looking for some insights into authors Yeldham and Patchett. Long holiday weekend ahead so writing output will be down. The Library is where I work best.